psi Vibrations and Remote Viewing Your browser does not support the audio element. "intuitive signal about a person or thing" was popular late 1960s, but has been recorded as far back as 1899. Listening to this music you can hear the sound vibrations (with varying frequency and magnitude) of the voices and instruments - a musical mix of vibrations. The words, "I love the colorful clothes she wears", takes for granted the complex electromagnetic vibrations inherent in the sunlight. The wind too has vibrations associated with it. The significance of vibrations goes much deeper than our normal senses. In particular, consider the infinitesimal vibrating "strings" in multiple dimensions that unify Quantum Mechanics (QM) and general relativity. The various vibrations of these strings can explain all of the particles that make up matter, light waves and the fundamental forces of our physical world. This string theory is quite an achievement for theoretical physics and shows how fundamental the very concept of vibrations is. "I'm pickin' up good vibrations"
The objective-measurable physical vibrations of sound, sight, smell, touch and taste activate a subjective, very personal, conscious response involving feelings and thoughts. This subjective response is fundamentally different than the objective vibrations. Subjective vibrations cannot be directly/objectively measured. Indirectly, science has already measured the brain's response to conscious and subconscious feelings-thoughts of the mind. Yes, the physical brain shows measurable signs of subconscious (i.e., unconscious, subliminal, or 'hidden') thoughts and intentions - see the two articles/links below. 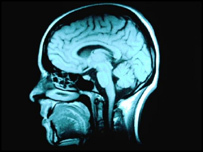 Scientists say they can read a person's unconscious thoughts using a simple brain scan. Functional MRI scans (fMRI) plot brain activity by looking at brain blood flow and are already used by researchers. A team at University College London found with fMRI they could tell what a person was thinking deep down even when the individual was unaware themselves. Click the arrow to see the 14 minute (with commercial) video produced by "60 minutes" on the growing capability to analyze fMRIs that include "mind reading" intentions. The physical manifestations of thoughts, emotions, intentions, etc, in the brain are not the same as the associated subjective responses. These internal responses are separate "things" that can be thought of as subjective vibrations that primarily exist outside of the four space-time dimensions, just like those QM strings. There are dimensions of ideas and emotions that have their own unique vibrational signatures. Your subjective response of seeing the color red may have an identifiable pattern on a fMRI; but more importantly, you know that red feels different than yellow. The color red has its own fundamental vibrational feeling...a vibrational feeling, or signature, that is different from yellow, green or blue. Similarly, there are personal and unique subjective vibrations of sounds, smells, touch sensations, and tastes. Ideas also have their own special vibrational feeling. Ideas, as expressed with words, are probably among the most fundamental vibrations. For example, the idea of the color "red", _redness_ itself, has a unique vibrational pattern. When you see the color red, your response is entangled with that fundamental pattern as well as the circumstances. Thus, your experience is different when you see a red dress vs. a red stop sign. Let's put these ideas into a model for consciousness. The key elements of the model are listed in the circle below. Consciousness is taken as a given - "Consciousness is The Fundamental" in this model. Vibrations distinguish one thing within consciousness from another thing. I am a conscious thing. You are a conscious thing. We each have the capability to focus using intention. I am conscious of subjective vibrating "things" (experiences, sensations, emotions, thoughts-ideas, etc). I am conscious of you. You and I can agree on the meaning of words and measurements for many things. Our joint objective physical reality is based on these agreements. Every thing that consciousness touches (including past-present-future events and other dimensions, etc.) can be visualized as being in the blue circular area without a boundary - this circle without a boundary is a useful metaphor for the Universe of Collective Consciousness (UCC) (see figure at right). This Universe cannot have a boundary, since if any thing that consciousness touches was outside the boundary, that thing would have to be included as being inside. Thus, there can be no "outside" and therefore no boundary to our circle or to the UCC. The UCC contains EVERYTHING, and it is the only thing without a boundary - it is unique as the only "oneness" in this model. Any other thing must have a "fuzzy boundary" since it can never be completely removed from the UCC. Any attempt by me or you to separate any thing from the UCC creates entanglement with some uncertainty. We lose the perfect Harmony and gain the here and now conscious vibrating living experience. We propose that objective and subjective things follow the same laws of entanglement and uncertainty. The mathematical model-law of quantum mechanics is the extraordinarily accurate model of the objective physical universe until we get into the realm of general relativity. We do not have a mathematical model for the subjective aspects of the universe. Consciousness does not need a separate definition or separate explanation. Consciousness is experienced directly, known first hand, e.g. your awareness of events, or "I think therefore I am". Consciousness is at the foundation of our reality. Events are "things" as real as the particles, waves and force fields in the current reality paradigm; so are thoughts and feelings. The subjective consciousness of human beings may be what makes us so human. We respond to music and perfume quite differently than other animals or rocks. We each have a unique vibrational pattern. In the physical universe, we are entangled and anchored with the vibrations of our unique genetic molecular code that was established at our conception. In the non-physical universe of ideas and emotions, we have a unique spiritual signature perhaps entangled with the vibrations of our directly experienced thoughts and feelings. In any case, we are a conscious part of a universe of consciousness that includes every thing, i.e., all-that-is. More and more scientists are concluding that consciousness itself is a fundamental aspect of the universe. Quantum mechanics is now telling us unambiguously that consciousness creates reality. And since quantum physics is at the root of everything, this has profound consequences for the interpretation of our own nature, the universe, and, yes, even why it may make more sense to trace everything back to a conscious intelligence rather than inanimate fields and forces. Your subconscious mind is the "submerged" portion of your consciousness not currently being experienced in the here/now with your conscious mind. Your subconscious mind is a thing that is entangled with the UCC and info from consciousness anywhere, anywhen, and anydimension. Dreams, memories and psi (psychic, paranormal, remote viewing, etc.) phenomena are examples of how this entanglement provides information to your conscious mind. The subconscious vibrations may be at very high frequency in physical space such that their exceedingly small wavelengths extend down to the quantum level. It is these quantum-level vibrations that cross-over into other "dimensions" (maybe via zero point energy) and can thereby communicate non-locally via the UCC about the past, present and future. Precognitive remote viewing illustrates the integrated nature of the "future" with the present here/now conscious moment. Quantum Mechanical mathematical models, and other models that include psi and precognition, have not been able to make useful predictions concerning consciousness. The psi (y) Vibration model is an interpretation of consciousness using a "word-idea" model. This is analogous to the various interpretations of QM, however, we have no mathematical model. Often however, much insight can be obtained from just the model interpretation. Your consciousness usually organizes/names events with a fuzzy beginning time and ending time. In the above sketch, two event things are shown as red circles with the black fuzzy boundaries. One is the Remote Viewing (RV) session and the other is the FeedBack (FB) session where a slightly older you experiences the correct target. These two events, like all events, are connected...they are vibrationally entangled through the fuzzy boundaries. Session also involves objective and subjective "things". Examples of measurable objective _objs_ (shown in dark blue) include: your physical location, the chair you are sitting on, the pen and paper you are using in your RV session; the RV transcript including the individual sketches and word/phrases, and the target which is known during the FB session, with all its objective elements of size, color, sound, action, etc. Objective things can be independently evaluated/measured by many different people with the expectation of getting the same measurement within some uncertainty. Examples of subjective _vibes_ (shown in purple) include: start-up thoughts and feelings, e.g., about your comfort level with your location, chair and pen; images, words, thoughts, emotions, concepts that enter your conscious mind; physical sensations in your fingers as you sketch and write your impressions in your transcript; thoughts and feelings about the target during your FB session. There are conceptual overlaps between these ideal types. For example, the feeling of happiness, or the feeling of pain, as experienced in the here/now is a _vibe_. And yet, the degree of this happiness experience can be measured, at least subjectively. An example of a subjective measurement is when you are asked about your happiness level using a smiley chart, or perhaps on a 1 - 10 scale. This subjective feeling-level is a measurement of quantum entanglement between you and the _vibe_ of happiness. Subjective information, e.g. images and words, comes from the subconscious. These are objectified in the RV transcript. The reality of precognition in this RV-FB circumstance can be viewed as demonstrating communication from the FB session with the "earlier" RV session. The primary problem with this thinking is that "earlier" implies a separation between the two events...a separation that does not exist. The more accurate concept is that of entanglement. Entanglement of two things (e.g., photons) in quantum mechanics means that the two are a unit, a system. Any change in one is instantly (non-locally) felt by the other because there is a full system instantaneous connection, i.e., entanglement. Words and sketches are entangled as well. "Entanglement can be measured, transformed, and purified. A pair of quantum systems in an entangled state can be used as a quantum information channel to perform computational and cryptographic tasks that are impossible for classical systems." This quote from the Stanford Encyclopedia of Philosophy can now be naturally extended in our psi* vibration model to include ideas, imagination, feelings, thoughts, and any other thing. Entanglement itself is a thing of consciousness and yet it is valuable to show it's measurement, or magnitude property, using yellow arrows as show on the figure. Very small magnitudes of entanglements are implied by the fuzzy boundary and stronger entanglements are indicated by the yellow arrows. We can now apply the model to the following important, at least to remote viewers, question: What are those "things" that can increase the magnitude of entanglement between the RV and FB Sessions? Your first-hand experiences show that "focus" is one key thing. Your focus clearly affects the strength of the connections/entanglements between you and the things associated with your focus. For example, please focus on your most recent dinner. You probably remembered something about that dinner and are more entangled with it now than before I made the request. Now focus on your most memorable childhood event...didn't you feel-sense emotion and/or some special meaning. So, notice that preceding the focus is the subtle intention to focus on some single thing. Your intention to focus on one thing, with emotion and meaning, is important to increasing the magnitude of your entanglement with this thing. Defining the one thing to focus on is important. Defining it with emotion and meaning is just as important. So back to the question. To increase the entanglement between the RV and FB sessions, we must first reset our intention to focus on one thing. Note that the original question assumes there are two things, the RV Session and the FB Session. We need to transform the question, which is very intellectual and looking for an objective answer, into a subjective intention to focus. For example: Create a harmonious system between the RV and FB sessions. The previously separate FB and RV sessions are conceptually combined into one entangled RV-FB system. Within this harmonious system, information is more freely shared between the RV and FB sessions. The harmony will feel wonderful, and the system should have a personal meaning, e.g., a practical application/demonstration of precognitive information being shared via the UCC. c.1384, ... literally "means of joining," related to harmos "joint, shoulder," from ar - "to fit together." Musical sense is oldest in English; that of "agreement of feeling, concord" is from 1588. This definition of harmony includes multi-dimensional vibrations, especially since thoughts and emotions are in dimensions of a different sort. 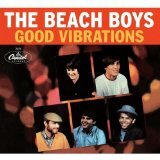 The vibrations have meaningful (e.g., harmonically fit together) relationships. Harmonious systems often provide strong feelings (emotional and/or physical) of resonance. Resonance is "an abnormally large vibration in a primary system produced in response to a relatively small stimulus, occurring when the frequency of the stimulus is the same, or nearly the same, as the natural vibration frequency of the primary system". In the psi vibration model, however, the mindset concerning resonance is quite different. Namely, the primary system and the stimulus form one vibrating system. The primary system responds with an abnormally large vibration when the stimulus happens to vibrate near the natural frequency of the vibrating system. The stimulus, the primary system, and the vibrating system itself are all in harmony together - they fit together like a joint/shoulder in one unified system. The FB and RV Sessions are combined into One Harmonious System that Shares _objs_, _vibes_, emotions and meaning. In the RV-FB system, shown in the light blue circle at the right, the RV session and the FB session form one unified system. This system is the focus of intention and it begins to quietly vibrate when you establish your intention to focus. Conscious and subconscious internal entanglements, shown as yellow arrows, increase the system harmony and the effectiveness of the intention. These activate the abnormally large vibrations that share accurate FB information with your conscious mind during your RV session. Your chemical electromagnetic physical body, including your nervous system, is labeled as 'PB' in the RV and FB sessions. The Viewer's Transcript, with sketches and word descriptions, is "first" (in-linear-time) created during the RV Session and is entangled with all the _vibes_ during that session; only a single yellow arrow is drawn within the RV Session as an example of how an entangles _vibe_. 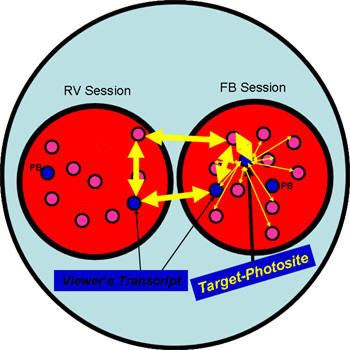 Similarly, the viewer's transcript is part of the FB Session and it should be strongly entangled with all the _vibes_ in the FB session, especially the Target-Photosite. The Target-Photosite contains the objective information recorded in a photograph concerning the physical location or site at the time the photo was taken. The objective information easily inferred from the photo is the target-photosite. This includes, for example, visuals, sounds, smells and any activity that is clearly at the photosite. Your personal cool-down period (relaxation, set your intent, clear the mind) for each session. These can include a brief affirmation. e.g., "I will experience the greatest possible harmony between my RV and FB sessions." Subjective conscious images, thoughts, emotions, sounds, sensations, words, etc. that are experienced during the RV and FB sessions. Consciously increasing the internal entanglement of these _vibes_ in the FB session is something that you can and should do with intention and focus. Of particular importance are the yellow lines connecting the actual target-photosite to the FB _vibes_. These FB _vibes_ and entanglements can act as the stimuli to resonate the system and share target-photosite information from the FB session with the creation of the RV transcript. One example of a strengthened FB _vibe_ is shown using the thicker yellow entanglement arrows. In the FB Session, note the three thick entanglement arrows focused on the example _vibe_. There is strong internal entanglement with the Viewer's Transcript and the Target-Photosite. One aspect of the viewer's transcript has been converted to a strong FB _vibe_ by "intentionally being" at the target-photosite. You imagine yourself being there and consciously experiencing the reality there, using the photograph as a launching pad. Then, the resulting strong FB _vibe_ is shared with the RV session and recorded in the RV transcript because of the harmony of the RV-FB system. Create the one system intention to be entangled, and the intention to be in system harmony - to be joined as one. Attention to the subtle, and yet often surprising, _vibes_ of information that come from the subconscious mind. 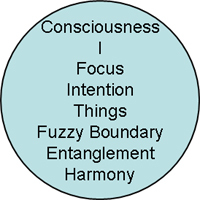 Your subconscious mind is in the UCC, so your sub is in all of the fuzzy boundaries and entangled with them to one degree or another. The fuzzy boundaries of all things are entangled with you and each other because of direct access via the UCC. Intentionally entangle these in your RV and FB sessions knowing that they will increase the system harmony. For example, feel the joy when the transcript matches the Target-Photosite during your FB Session. Feel this same joy in the RV session. You should personalize your approach because this will increase the entanglement and thus the system harmony. You, and you are more than your physical body, are in both sessions...right? So harmonize them in your own way. Let your quantum computer self be your guide. The model encourages you to have as much in common as possible in both sessions. So why not bring love and joy and harmony into the RV and FB sessions. These are great things to experience and entangle. This thing thing is a bit annoying, and yet it is an important feature of the model because the model thereby becomes very general including things from the physical (electons, photons), mental (thoughts, ideas), emotional (happiness, love), and space/time with its active and passive modes, the here/now, and the eternal. Bi-location experiences are dramatic examples of achieving psi vibrational harmony. Bi-location is when a person is, or appears to be, in a second place/time from where the bi-location event is initiated. This type of event is often spontaneous. In Remote Viewing, bi-location occurs often enough that it appears in the Military - Army Intelligence- CRV Manual as "when the viewer perceives he is too much absorbed in and transferred to the site and cannot therefore appropriately debrief and objectify site information". So in military remote viewing, bi-location was considered a problem because the objective information stopped flowing. However, the direct experience is apparently awesome. The viewer experiences being at the "other" location and often experiences a different time-period. Sometimes individuals at the other location/time will notice the viewer**. Now that's strong harmonious entanglement! One final connection: If the focused thing of interest is an entire species, the Morphic Resonance ideas of Rupert Sheldrake readily fall out of this model. Sheldrake postulates, and shows some experimental data, that information can be shared with a kind of non-local memory among members of the species. Thus information can influence learning, behavior and the development of that entire species. For example, once a few members of the species learn a new behavior which would benefit the entire species, the _vibes_ of this new behavior become part of the Universal Collective Consciousness and are available to all members. The _vibes_ of other members would probably entangle this new behavior most strongly in times of need. The psi Vibration model also predicts that beneficial behaviors could be learned from the future. psi vibrations follow the same general laws as all the other vibrations within the Universe...so, feel those "Good Vibrations". All the known fundamental particles - including the messenger particles - have properties resulting from these types of vibrational patterns. This fact is one of the most attractive and unifying aspects of string theory - it postulates that all particles are made of the same "fabric," as opposed to the particle-physics view that each elementary particle is in effect "cut from a different fabric" (Brian Greene, The Elegant Universe). Associative Remote Viewing (ARV) - An approach to applying precognition. *In QM, the primary model function is usually expressed with the greek letter psi, which is a probabilistic complex wave function that vibrates with a real part and an "imaginary" part. The need for an imaginary part (or an equivalent matrix formulation) hints at the need for dimensions of ideas, emotions, and other non-space/time aspects of reality.